This sweet potato cake with brown butter sage frosting and a crown of fresh sage leaves would be the perfect centerpiece for a seasonal gathering. My parents have always told me that when I was a baby, my favorite flavor of baby food was sweet potato. Decades later, not much has changed. I will almost always migrate towards recipes, menu items, or baked goods that contain sweet potatoes (or pumpkin, or butternut squash for that matter!). I am bound to love just about anything that contains these bright orange vegetables, but one of my absolute favorite dishes is sweet potato gnocchi. When I was in college, my friend Kerry and I started making dinner together regularly. She was living in an apartment for the first time and wanted to start really learning to cook. And since cooking has long been one of my favorite pastimes, I was more than happy to help! I love that we’ve even kept up the tradition since graduating college, albeit with less frequency. Over the years, Kerry and I have tried lots of new recipes and learned all sorts of cooking techniques. Our dinner menus have included everything from cornbread topped mac and cheese to baked chicken tenders, to Polish dumplings, to Spanish croquettes! But of all the unique and wonderful dinners we’ve made, one of the stand-outs is our sweet potato gnocchi with Italian sausage in a brown butter sage sauce. We made piles and piles of gnocchi that night and it took us hours, but oh was it worth it! Our gnocchi dough was completely handmade from scratch, starting with baking and mashing our own sweet potatoes. We rolled out the dough by hand, sliced it into little pillows, and pressed each one along the tines of a fork to achieve the traditional gnocchi shape. Dinner was served approximately three hours later than we had planned, but it was wonderful. Maybe it was just because we were so desperately hungry, but I think there’s something truly special about a meal that you’ve labored over. And we poured our heart and soul into that gnocchi. Which brings me to this sweet potato cake with brown butter sage frosting. I know, I know, you’re thinking, “who is this girl who bases a cake recipe off a savory pasta dish? ?” But just trust me here, okay? Give this cake a chance, and I’m going to make you a believer in baking cakes with vegetables and herbs. Just like the gnocchi, this cake starts with a few baked sweet potatoes (I promise it’s less labor intensive than gnocchi though!). 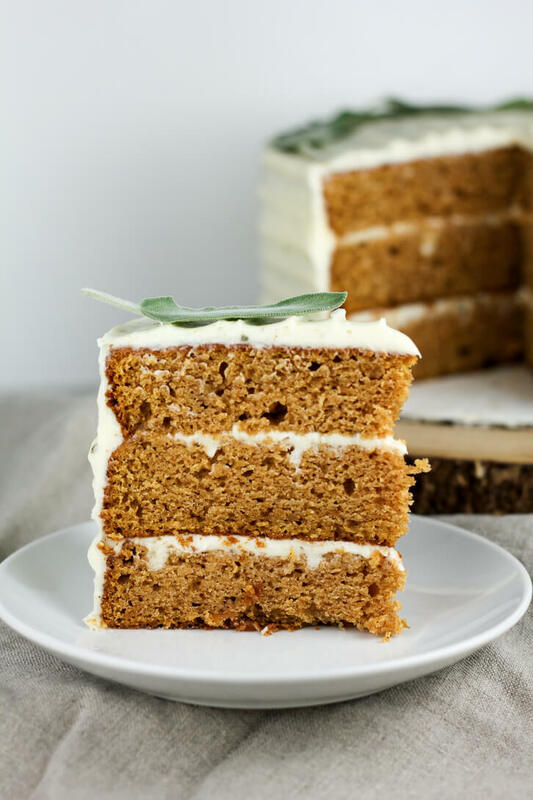 There’s a lot of sweet potato packed into this cake, and the color it gives the layers is perfection! I always prefer to bake and puree my sweet potatoes myself, rather than use a store-bought puree. It totally makes a difference, and it’s quite simple! All it takes is a little bit of planning ahead to give the potatoes enough time to bake, as well as to cool down. Oh, and you’ll want a good food processor to help you quickly break down the baked potatoes and get a nice puree. I love my Ninja Kitchen System for this, it’s a super versatile gadget and I use it for everything from making my morning smoothies to grinding my own almond flour. To pair with the sweet potato cake, I made a brown butter sage frosting, inspired by the sauce Kerry and I made for our gnocchi. I admit, sage definitely isn’t the first flavor you’d think of for frosting, but I love how sage pairs with both the sweet potatoes and the warm, nutty aroma of brown butter. Let’s talk about brown butter for a minute here! I love the complexity of flavor that brown butter adds to baked goods (try making a chocolate chip cookie with brown butter). It will instantly take your frosting up a notch, plus I think it sounds fancy. 🙂 For frosting, it’s best to chill your butter again after it’s been browned so that it re-solidifies. Then, it can easily be whipped up into a nice buttercream, just as you would normally do. Altogether, the sage, brown butter, and cream cheese in the frosting brings just a hint of savory to the cake. At the same time, there’s still plenty of sweetness to be had in every slice of this sweet potato cake! The perfect balance of savory and sweet. So, if you’re still thinking about what to make for dessert on Thanksgiving, trade in the pies for this sweet potato cake! It’d be the perfect end to a festive meal with family and friends. Or, you know, you could always bake a pie and a cake. No judgment from me! Stay tuned for another holiday-ready cake recipe coming next week! It’s inspired by my childhood Thanksgivings. Stay in touch on Instagram and Facebook, and subscribe to the Flour Covered Apron newsletter (see sidebar) so you don’t miss it! Melt the 3/4 cups butter in a medium size skillet over medium heat. Once butter is just melted, add the one tablespoon of finely chopped sage leaves. Keep stirring the butter, it will begin to foam. Continue to cook the butter until it is lightly browned and develops a nutty aroma. This will likely take about 5-7 minutes. Remove the butter from the heat and pour it into a heatproof bowl. Refrigerate it while you bake the cake. Preheat oven to 350 degrees and line the bottoms of three 8 inch cake pans with parchment paper. Then, grease and flour the pans. In a medium size bowl, whisk together the dry ingredients (flour, baking powder, baking soda, spices, salt). In a large bowl, whisk together melted butter, both sugars, and vanilla extract. Add the beaten eggs and whisk to incorporate. Fold in the dry ingredients with a wooden spoon (batter will be very thick). Then, fold in sweet potato puree. Divide evenly between the three prepared cake pans and bake at 350 F for 25-30 minutes, or until cake passes the toothpick test. Let cakes cool in pan for 5 minutes, then turn out onto a wire rack to cool completely. Using an electric mixer, beat brown butter on medium high speed until light and fluffy. Then add cream cheese, beating on medium high speed until well incorporated. Add salt and vanilla, then gradually add powdered sugar, beating on low speed to combined. Add heavy cream one tablespoon at a time, beating to incorporate after each addition. Once cakes are cool, level each layer by slicing off the rounded domes with a cake leveler or serrated knife. Top the first layer with about 3/4 cup of frosting and spread evenly with an offset spatula. Top with second layer and repeat. Place third layer on top, then frost the top and sides of the cake with remaining frosting. Decorate with fresh sage leaves as desired. *From 2-3 large sweet potatoes, pricked with a fork, then baked in an oven at 400 degrees Fahrenheit for 45-60 minutes, or until fork-tender. Let potatoes cool, then peel and puree in a food processor until smooth. OMG!! So glad I run into your blog, the photos are AMAZING and I’ll have to try this recipe! Thanks so much, Neta! I’d love to hear how it turns out for you.